movies Archives - Who Said Nothing in Life is Free? “Pirates of the Caribbean: Dead Men Tell No Tales” arrives on 4K Ultra HD™/Blu-ray™ Combo Pack, DVD and On-Demand on October 3. 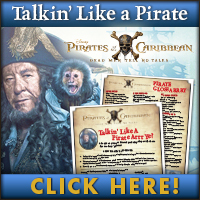 “Pirates of the Caribbean: Dead Men Tell No Tales” is a rollicking new tale of the high seas, infused with all the elements of fantasy, humor and action that have resulted in an international phenomenon for the past 13 years. Johnny Depp returns to his Academy Award®-nominated role as the outrageous, swashbuckling scoundrel Captain Jack Sparrow, and is joined by Oscar® winners Javier Bardem (Best Supporting Actor, “No Country for Old Men”) and Geoffrey Rush (Best Actor, “Shine”). My family is a huge fan of the Pirates of the Caribbean movies and this one didn’t disappoint. My sons favorite thing to watch is all the bonus clips and with Johnny Depp the bloopers are sure to crack you up. Also the making of the movie is really interesting so don’t skip it !!! Disney and Jerry Bruckheimer Films present Pirates of the Caribbean: Dead Men Tell No Tales is a rollicking new tale of the high seas, infused with all the elements of fantasy, humor and action that have resulted in an international phenomenon for the past 13 years. 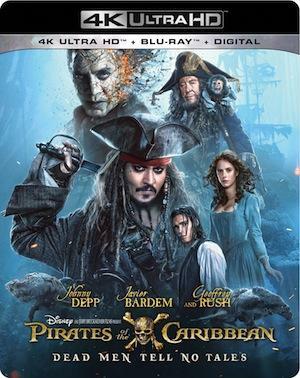 Johnny Depp returns to his Academy Award®-nominated role as the outrageous, swashbuckling scoundrel Captain Jack Sparrow, and is joined by Oscar winners Javier Bardem and Geoffrey Rush. It was announced at D23 Expo that “Pirates of the Caribbean: Dead Men Tell No Tales”—the fifth film in the now-iconic “Pirates of the Caribbean” film franchise—will sail home on Digital in HD and 4K Ultra HD™ on September 19. 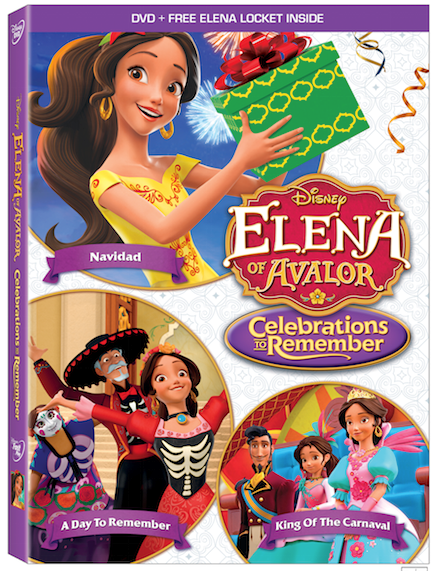 Aimee Carrero (Freeform’s “Young & Hungry”) as Princess Elena; Jenna Ortega (Disney Channel’s “Stuck in the Middle”) as Princess Isabel; Chris Parnell (“Sofia the First”) as Migs; Yvette Nicole Brown (“Community”) as Luna; Carlos Alazraqui (Disney Pixar’s “Inside Out”) as Skylar; Emiliano Díez ( “George Lopez”) as Francisco; Julia Vera (ABC’s “General Hospital”) as Luisa; Christian Lanz (“Teenage Mutant Ninja Turtles”) as Chancellor Esteban; Jillian Rose Reed (“Awkward”) as Naomi; Joseph Haro (“Awkward”) as Mateo; Jorge Diaz (“The 33”) as Gabe; Keith Ferguson (Disney Pixar’s “Inside Out”) as Zuzo; Joe Nunez (“Jake and the Never Land Pirates”) as Armando and Jane Fonda (“Grace and Frankie”) as Shuriki. 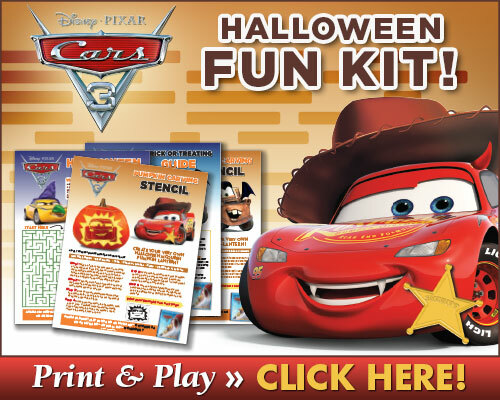 This is such a cute DVD and your kids are sure to love it. My favorite episode was “King of the Carnival”. Make sure you come back and tell me which was your favorite after you watch it. 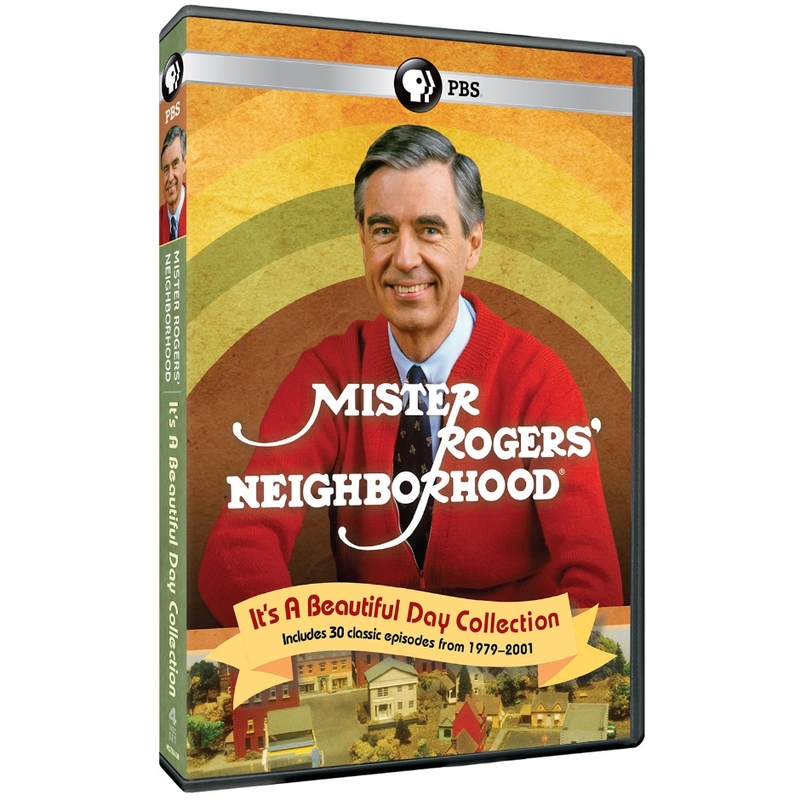 I love how this DVD teaches you that holidays aren’t about what you do; they’re about the special people you spend them with !!! 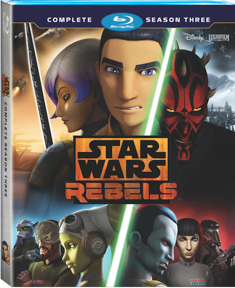 Star Wars Rebels: Complete Season 3 delivers all 22 action-packed episodes of the hit CG animated series’ third season, plus exclusive, never-before-seen bonus material on Blu-ray™ and DVD on August 29. The story threads begin to tighten in this thrilling season of Star Wars Rebels, drawing connections to The Clone Wars, Rogue One and the original Star Wars trilogy into the series’ epic storyline. Available August 29, Star Wars Rebels: Complete Season Three delivers some of the most critically-acclaimed Star Wars storytelling to date, with engaging characters, harrowing conflicts, and spectacular space battles on par with those seen in the films. · Return To Mandalore – Explore where Mandalore fits within the Empire’s regime – and whether Sabine can unite her people against the Imperial forces. · Thrawn: A Legend Reborn – Learn Thrawn’s significance in Star Wars lore, and what the future may hold for this memorable villain. · Apprentices to Outcasts: Kenobi And Maul – Track two adversaries who’ve clashed throughout Star Wars history, and find out why the time was right to conclude their story. · The Original Rebel: Saw Gerrera Returns – Extended – Meet the Original Rebel. This exclusive extended version features Forest Whitaker discussing the character he brings to life in both Rebels and Rogue One. · A Rebel Alliance – Discover how the formation of the Rebel Alliance in Rebels ties into the Rogue One timeline – and the exciting story possibilities that lie ahead for season 4. · Rebels Recon – Go behind the scenes with the cast and crew in 19 entertaining and information-packed episode recaps! My sons thoughts….. he really liked it. This is the 3rd season and we actually have the first two seasons and well and he said it was “cool”. He especially liked some the bonus features such as the episode recaps. 2. Audio Commentary – View the film with commentary by producer Don Hahn and co-directors Roger Allers and Rob Minkoff. 3. Visualizing a Villain – Against a backdrop of live dancers and the animated “Be Prepared” sequence, artist David Garibaldi paints a masterpiece of evil. 4. The Recording Sessions – Watch rare footage of the actors recording their roles, matched with the final animation. Intro by Roger Allers and Rob Minkoff. 5. Nathan and Matthew: The Extended Lion King Conversation – Nathan Lane (Timon) and Matthew Broderick (Adult Simba) offer candid and hilarious insights into their Lion King experiences. 6. Inside the Story Room – Co-directors Roger Allers and Rob Minkoff present archival footage of five original story pitches. 7. 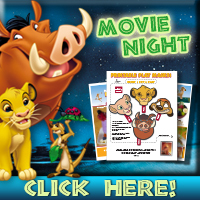 Music & More – Sing along to your favorite songs from the movie! 9. 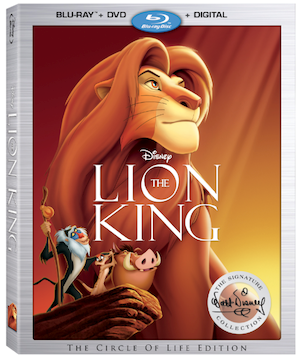 Classic Bonus Features (Digital Only) – These offerings from prior home entertainment releases include hours of bonus material, such as bloopers, audio commentary, deleted and alternate scenes, and in-depth journeys into the music, film, story, animals and stage show. My thoughts…. this wasn’t my first time seeing Lion King, in fact it was probably my 100th. It was so much fun singing along to all the songs with the kids. I just love that I now have it on Blu-Ray instead of just a VHS. Marvel’s Guardians of the Galaxy Vol. 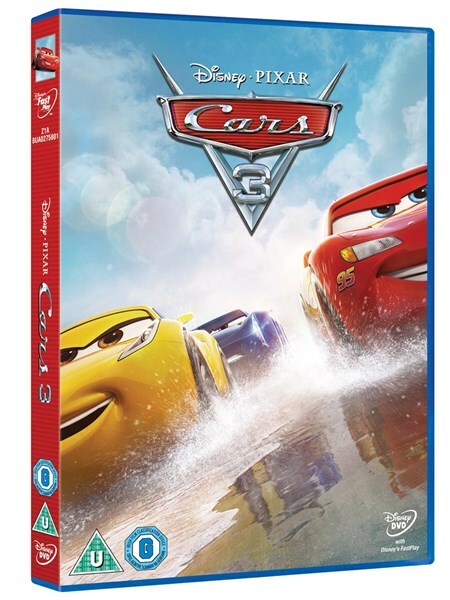 2 marks the Studios first in-home title to release in stunning 4K Ultra HD format, providing consumers with the ultimate home entertainment experience with next-generation high dynamic range visuals and Dolby Atmos immersive audio. Set to the all-new sonic backdrop of Awesome Mixtape #2, the film’s storyline continues the team’s adventures as they traverse the outer reaches of the cosmos. The Guardians (Chris Pratt as Peter Quill/Star-Lord, Zoe Saldana as Gamora, Dave Bautista as Drax, Vin Diesel as the voice of Groot, and Bradley Cooper as Rocket) must fight to keep their newfound family together as they unravel the mystery of Peter Quill’s true parentage. Old foes become new allies and fan-favorite characters from the classic comics will come to our heroes’ aid as the Marvel Cinematic Universe continues to expand. 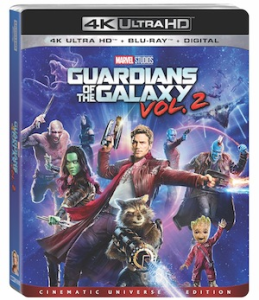 This blockbuster sequel featuring the world’s favorite band of intergalactic misfits, blasts into homes on 4K Ultra HD™ and Blu-ray on Aug. 22. Chris Pratt (“Jurassic World,” “Guardians of the Galaxy”) as Peter Quill/Star-Lord, Zoe Saldana (“Guardians of the Galaxy,” “Star Trek Beyond”) as Gamora, Dave Bautista (“Spectre,” “Guardians of the Galaxy”) as Drax, Vin Diesel (“Guardians of the Galaxy,” “Furious 7”) as the voice of Groot, Bradley Cooper (“Joy,” “American Sniper”) as the voice of Rocket, Michael Rooker (“Guardians of the Galaxy,” “The Walking Dead”) as Yondu, Karen Gillan (“Guardians of the Galaxy,” “The Big Short”) as Nebula, Pom Klementieff (“Ingrid Goes West,” “Oldboy”) as Mantis, Elizabeth Debicki (“The Great Gatsby,” “Everest”) as Ayesha, Chris Sullivan (“The Knick,” “This Is Us”) as Taserface, Sean Gunn (“Guardians of the Galaxy,” “Gilmore Girls”) as Kraglin, Tommy Flanagan (“Gladiator,” “Sin City”) as Tullk, Laura Haddock (“Guardians of the Galaxy,” “Luther”) as Meredith Quill, with Sylvester Stallone (“Creed,” “The Expendables”) as Stakar, and Kurt Russell (“The Hateful Eight,” “Furious 7”) as Ego. My family absolutely loved all the bonus clips especially the gag reel, music video and deleted scenes. This is a must have movie for all Marvel fans !!! In Descendants 2 the villain kids are back and the stakes are even higher in the highly anticipated sequel to the Disney Channel Original Movie “Descendants”! 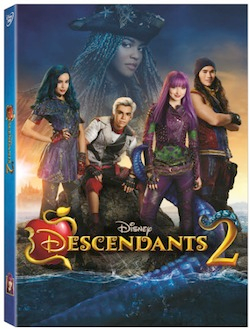 The story deepens in the music-driven sequel to the global smash hit “Descendants,” as the teenage sons and daughters of Disney’s most infamous villains try to find their place in idyllic Auradon. When the pressure to be royally perfect becomes too much for Mal, she returns to her rotten roots on the Isle of the Lost where her archenemy Uma, the daughter of Ursula, has taken her spot as self-proclaimed queen of the run-down town. Uma, still resentful over not being selected by Ben to go to Auradon Prep with the other Villain Kids, stirs her pirate gang including Captain Hook’s son Harry and Gaston’s son Gil, to break the barrier between the Isle of the Lost and Auradon, and unleash all the villains imprisoned on the Isle, once and for all. Bring home all the mischief on DVD August 15th. Dove Cameron, Cameron Boyce, Sofia Carson, Booboo Stewart, and Mitchell Hope reprising the roles of Mal, Carlos, Evie, Jay and King Ben, respectively. Starring as the new villains are China Anne McClain as Uma, the daughter of Ursula; Thomas Doherty as Harry, son of Captain Hook; Dylan Playfair as Gil, son of Gaston; and Anna Cathcart as Dizzy, daughter of Cinderella’s evil stepsister Drizella and granddaughter of wicked stepmother Lady Tremaine. Also reprising their roles in this sequel are Brenna D’Amico as Jane, the daughter of Fairy Godmother; Melanie Paxson as Fairy Godmother; Dianne Doan as Lonnie, the daughter of Mulan; Jedidiah Goodacre as Chad, the son of Cinderella; Zachary Gibson as Doug, the son of Dopey; Keegan Connor Tracy as Belle and Dan Payne as Beast. Descendants: Wicked World – A collection of all the animated shorts from season 1.